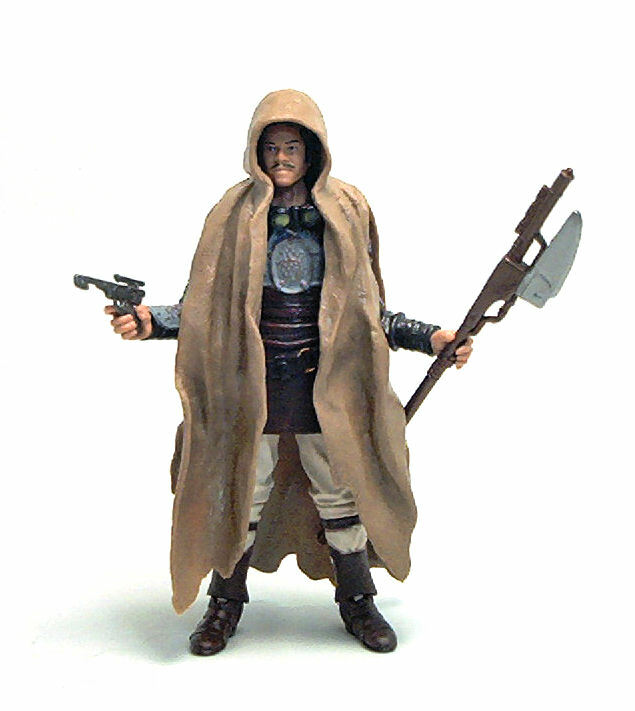 It’s been quite a while since we got a Lando action figure with his skiff guard disguise. Back in the 80’s that version of Lando was among my favorites because he had a removable helmet and that was pretty uncommon then. Kenner did release another, ultra-buff one for the Power of the Force line, and a few years later Hasbro followed suit and developed a more realistically proportioned figure that they used a few more times. 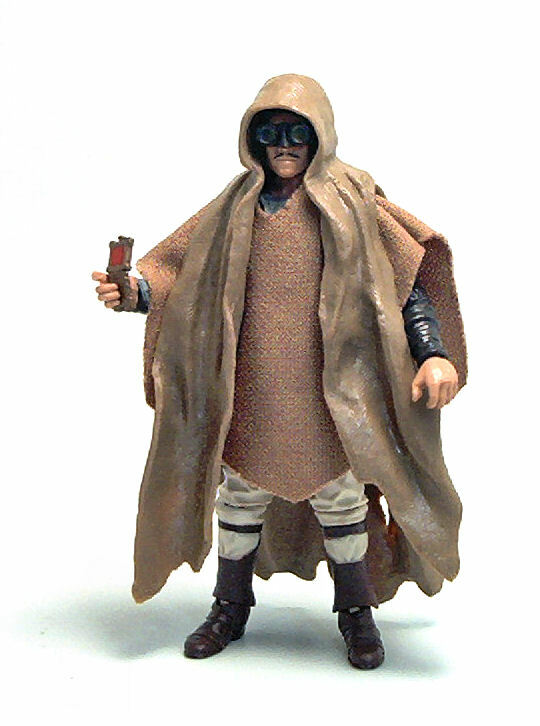 It wasn’t until now, in 2012, that we get the definitive update for the character, although Hasbro is calling it Lando Calrissian (Sandstorm Outfit), because the inspiration for this release came from the bonus deleted scenes included in the Blu –ray release of Return of the Jedi. The figure belongs to the second wave of figures from the 2012 Vintage Collection and together with the Leia released in this same wave and the other three figures of Luke, Han and Chewbacca released back at the start of the Legacy Collection, round up the cast from the deleted sandstorm scene. 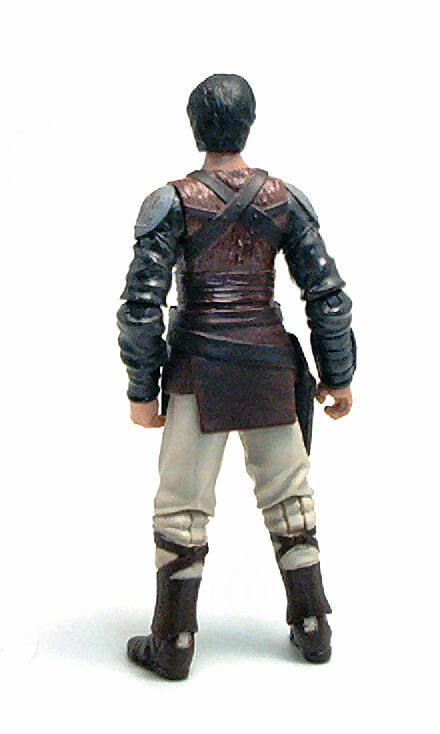 Lando’s outfit is the same skiff guard uniform he used during the first part of the film, and it is replicated very well in plastic with an excellent level of detail. The wasit piece is made of rubber and has a functional holster sculpted on the right side. Lando’s headsculpt is entirely new, and resembles actor Billy Dee Williams better than the previous one used for the General Lando version. As usual, the hips are a little impaired by the rubber skirt piece with the holster, but there is enough room for some dynamic posing. Lando is molded in thee colors of plastic, tan for the legs, brown for the torso, black for the arms and darker flesh for hands and head. This leaves only the armor, leather gear, straps and the facial features to be painted. These paint applications are remarkably neat , although I kind of feel they went a little bit overboard with the patina on the chest plate and shoulder pads. And Lando comes with a good number of accessories too. 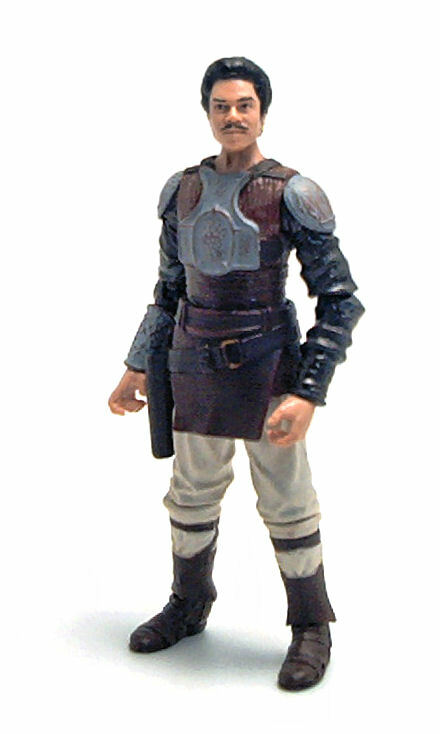 He comes with a vibro-pike, a removable helmet and a pistol, which is basically the Skiff Guard load-out. 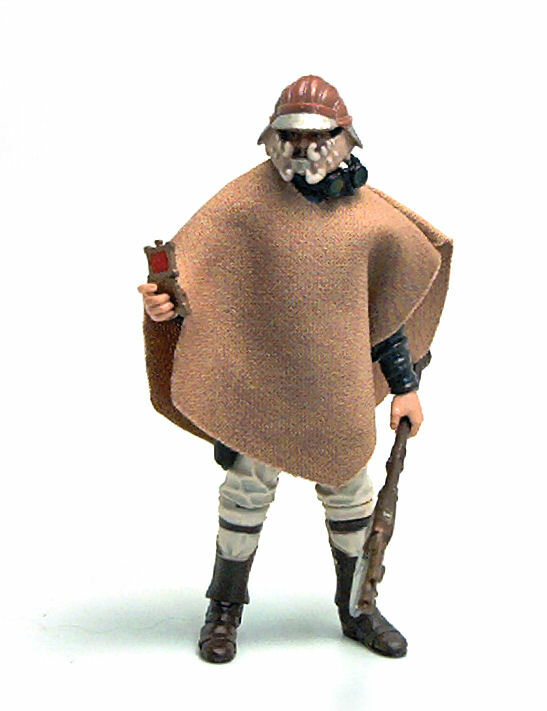 Then, there are the Sandstorm Outfit specific pieces, which consists of a pair of rubber goggles, a fabric poncho, a rubber hood and a small PDA-like device. Not all of the accessories can go onto the figure at the same time, but mixing and matching provides a good deal of display options for Lando. 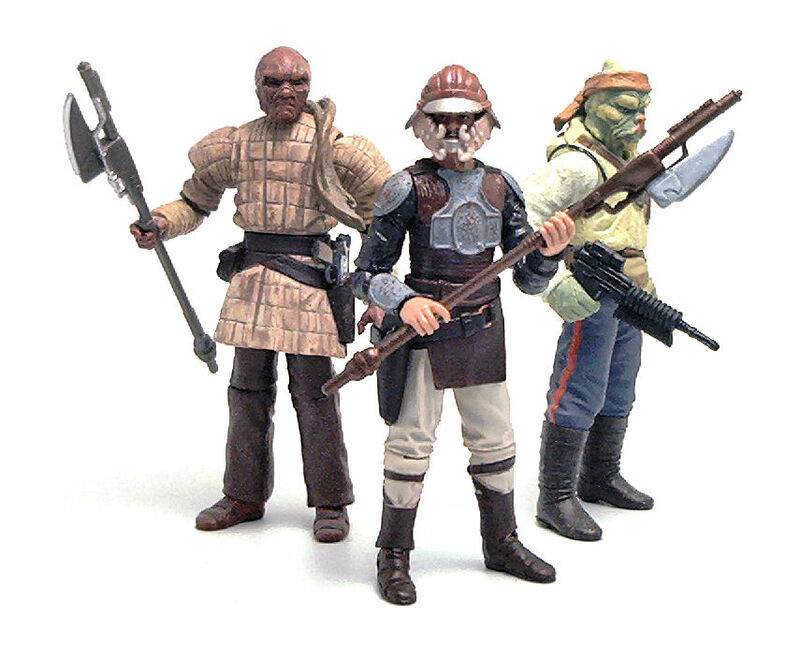 I may, eventually, get a second Lando to display in full Sandstorm gear, but for the time being i will leave my figure in Skiff Guard mode, chilling with the rest of Jabba’s thugs.